A redesigned BMW X3 rolls off the line at the automaker's U.S. plant in Spartanburg, South Carolina. At the X3's unveiling last week, executives promoted the Spartanburg assembly plant and its position as the top vehicle exporter in the U.S.
SPARTANBURG, South Carolina, USA — When BMW unveiled its redesigned X3 crossover last week at its assembly plant here, the vehicle itself was in the background for much of the ceremony. BMW leaders spent more time touting the plant, its contribution to the U.S. economy and the merits of free trade. The name seldom spoken but clearly hanging over the event: President Donald Trump, who put German automakers on the defensive during a European Union meeting in May when he reportedly called the Germans "very bad" and vowed to block their exports to the U.S. That followed Trump's January threat of a 35 percent import tariff on cars brought over the border. 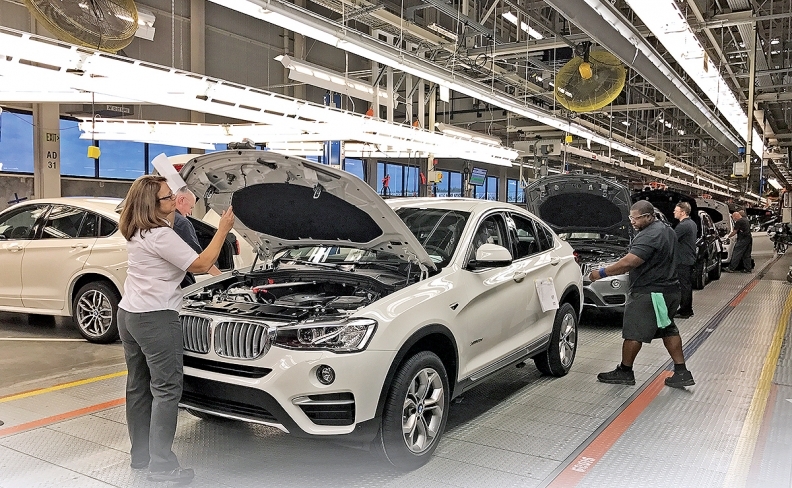 BMW emphasized over and over last week that the Spartanburg plant exports more vehicles than any other auto plant in the U.S. Of 1,400 vehicles assembled per day, 70 percent are exported to more than 140 countries. It makes Spartanburg a testament to free trade, BMW Group CEO Harald Krueger said. "Free trade has made this success story in the U.S. possible. I firmly believe in free trade and open markets," Krueger said. "It is essential for global businesses and economies around the world to flourish. We will keep investing in our people and in our business in the U.S."
Krueger, who accompanied German Chancellor Angela Merkel on a visit to the ​White House in March, has invited Trump to visit Spartanburg but the president hasn't taken him up on it. U.S. Sen. Lindsey Graham: "We need more trade, not less." 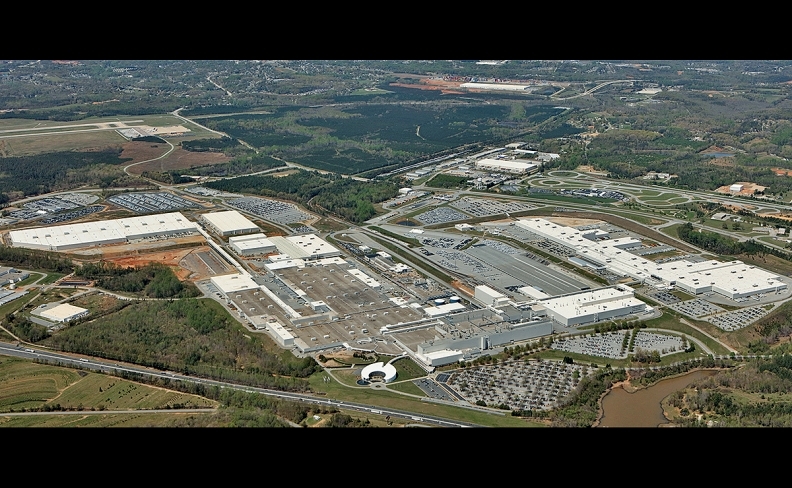 BMW has invested $8 billion in Spartanburg since announcing the plant 25 years ago. The company said last month it would invest an additional $600 million for manufacturing infrastructure to build crossovers. BMW assembles the X3, X4, X5 and X6 in South Carolina and will add the large X7 crossover to the plant in late 2018. Krueger notably avoided Trump's name during his prepared remarks, but U.S. Sen. Lindsey Graham, a South Carolina Republican, directly addressed the elephant in the room. 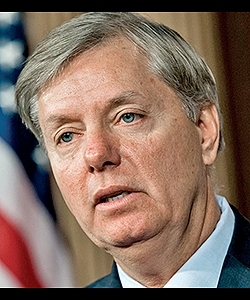 "If you build a car in Mexico and you sell it in Europe, there is no tariff," Graham said. "If you build a car in America and sell it in Europe, there is a tariff. President Trump: Negotiate a trade agreement with Europe so we can sell cars to Europe without a tariff. We need more trade, not less." For those who fear globalization, the BMW plant is an example of why people should embrace it and how it can be a net positive for the U.S., Graham said. Speaking to reporters after the plant ceremony, Krueger endorsed Graham's points. "We are in favor definitely that you reduce tariffs everywhere," Krueger said. "Tariffs do not help you grow the business. That's why, for example, the automotive sector in Mexico has grown in manufacturing production — because they have a lot of free trade agreements." Reducing tariffs between the U.S. and Europe would be a win-win, Krueger said. "It could grow the business on both sides." As for Trump, Krueger said he is not changing BMW's production plans because of the administration's rhetoric on trade. But he noted that plans could change with shifting trade policies. "I'm not concerned, but we need to play our role to make clear and take this plant as an example," Krueger said. "We are exporting 70 percent. If we would have trade barriers, maybe we would need to shift that production from here to somewhere else because it can be no longer affordable." In the meantime, BMW will continue to make its point about free trade, said Oliver Zipse, BMW AG board member in charge of production. Without free trade, the Spartanburg plant would not exist. Moving away from free trade policies "is a very dangerous path," Zipse said, because another country would likely raise its hand with its own newly enacted free trade policies and take business away from the U.S.
"We want to think that logic will prevail," Zipse said. "That's our hope."